Recently I was at Target and spotted two felt role play sets in the dollar spot area. One was a pizza themed set and another was holiday cookie themed. They were $3 each so I got both with the plan to combine the appropriate pieces from both to adapt one of my favorite early readers, The Pizza that We Made by Joan Holub, for storytime. I also want to add some plastic props to this set to better match the details from the story, which I will do but wanted to share the incomplete idea while the felt pieces may still be available in stores near you. I don't believe Target lists their dollar spot items online so I can't link them to you, unfortunately. 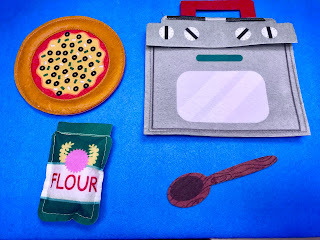 The flour, oven, and spoon pieces are from the cookie set and the pizza from the pizza set. The kits include "bonus" cookie and pizza trays respectively, but they are just the thin cardboard from the kit packaging and won't hold up for my purposes. I plan to buy real counterparts from a dollar or thrift store instead. I did want to say that I am not planning on adding a prop for every part of this story. There are some that I think can be very well acted out, like sprinkling the cheese on the pizza and chopping the veggies. So glad to hear that they are still available!